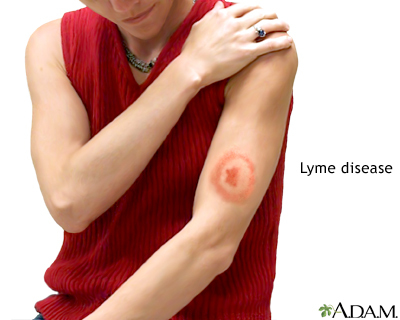 The most common early sign of lyme disease is the appearance of a rash on the skin that looks like a "bull's eye". The rash begins as a reddened area near the area of the tick bite. As the rash gets bigger, it clears in the center and develops a red ring around the outer perimeter. Other symptoms include muscle or joint aches, stiff neck, headache, weakness, fever, swollen lymph nodes and other flu-like symptoms.